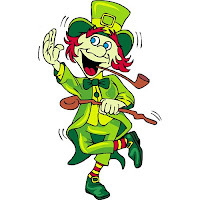 and all the other "magical" people that come in and out of our lives, but there is something really fun about being a Leprechaun! 2 years ago Megan decided the Leprechauns could never return because the peed in her toilet. She really didn't like that. In fact, for two weeks leading up to St. Patty's Day last yea, she was in a panic over the Leprechauns. We opted to leave them a note, asking them pee at the neighbors house. That went well. So this year she was very excited for them to come. So excited in fact, she drove me out of my mind talking about them for the past two days! Seriously, she wouldn't stop! This year she decided they were cool enough to pee in my bathroom but not hers. So we put a note on her potty and they complied. My toilet is filled with Leprechaun pee. The great thing about the Leprechauns is you never know what they will do! This year they rearranged the furniture in the living room, sprinkled green confetti everywhere and left shamrocks with notes in random places throughout the house. They also bought a Leprechaun hat and socks for each of the kids. And the best part...they took the three loads of laundry that I had just folded (yeah right) and threw it all over the house. Imagine how mad I am going to be at those Leprechauns! I have to admit, I was dancing and smiling while simply throwing the clothes up in the air instead of folding! It was quite a treat. Clean up after the Leprechauns is always a bit of a bummer, but it is worth it to see the kids faces in the morning. And the look of excitement on Jon's face when I serve him his annual Irish dinner...totally satisfying! One final thought...what do you get when you cross a four leaf clover with poison ivy? Okay - we want to come to your house for St. Patrick's Day. Hello - you're like the funnest mom ever! I'm totally going to have leprechaun pee in our toilet. It's brilliant! All right...I agree with Heidi. From now all all holidays will be celebrated at the Michell's house. The Leprechaun Pee wins! Haley has been talking about that Leprechan pee all day!